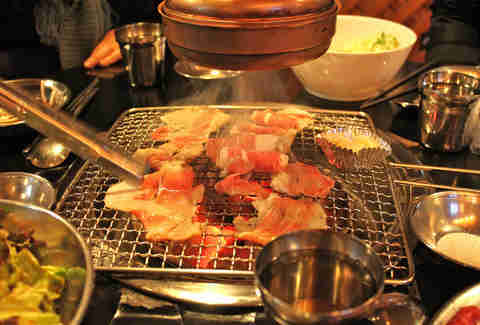 As opposed to a regular BBQ, K-style grilling is neither done stubbornly in the driving rain, nor even outdoors at all. The grill is traditionally built into the table, though you can relax, your server will cook it all for you, to your taste of course. The most common dish is Bulgogi -- thinly sliced beef tenderloin or sirloin, which has been swimming in a delicious bath of soy sauce, garlic, pepper, sesame oil, and sugar. Make the pilgrimage to Cah-Chi by Wimbledon, and have everything from beef ribs to pork belly marinaded in their house sauce, and scorched to your liking. Literally, it translates to “mixed rice” but there's a bit more going on. Generally, it's served in a massive bowl with rice (duh) that's then topped with a cornucopia of goodness like veggies, meat, chili paste, and importantly a raw or lightly fried egg, all of which is mixed at the last second before serving. Head to Soho to the undisputed king, and aptly named, Bi Bim Bap, and snag their signature Dol Sot, whose beef & 'shrooms are both cooked & served in a hot stone pot. Drinking food. That's not even hyperbole, that's literally what it means. 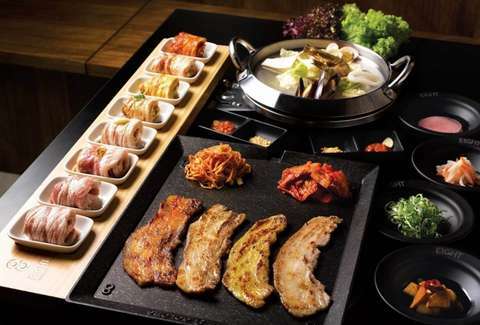 Yes, in Korea there is a whole style of food that is meant to go with booze. If that's not common sense, we don’t know what is. There is no one particular dish that is waving the flag for Anju, but whatever it is, it's best accompanied by beer or soju (Korean wine!). 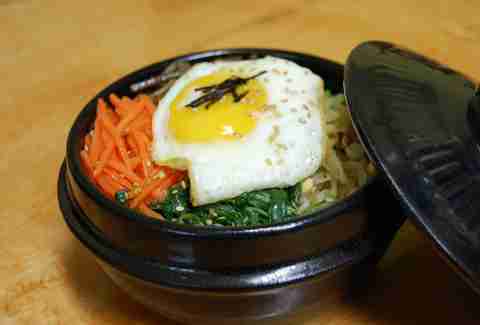 New kid on the Old Street is On The Bab, the first place to get these Korean-style ballast providers. 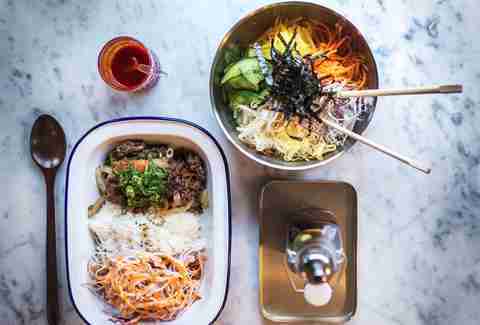 Think fried dumplings, kimchi arancini, or fried chicken, but another solid pick is Jubo which is also in Shoreditch. Um, street food. Well, Korean-American hybrid street food to be exact. For Korean traditionals, Americanized and made portable, Galbi Bros will furnish you with a delicious kimchi-topped spice-marinaded burger, trapped in a rice, noodle, or bread bun. 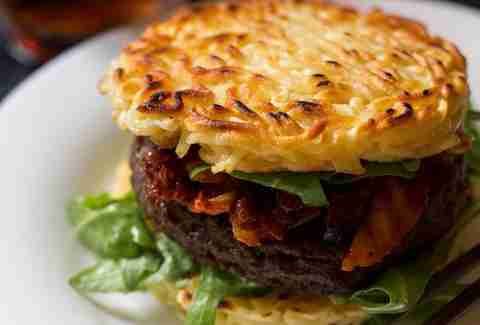 Busan BBQ, meanwhile, are bringing the Amerikorean dream to life with the likes of their Bulgogi Burger w/ mooli pickle at their upcoming pop-up on Feb 1st in Tooting. You probably know this one, but in case you don't, then A) God man, get out of the house, and B) it's like spicy sauerkraut, and it's basically the national dish of Korea. 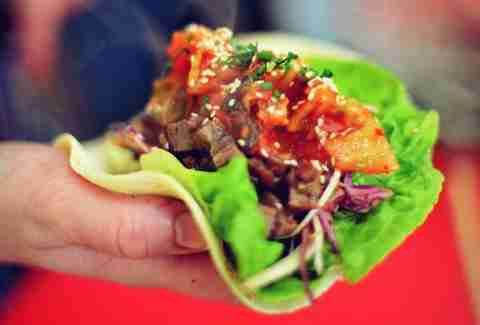 Obviously any K-eatery will have some, but head over to Catch Bar in Shoreditch for Kimchinary's residency -- their menu is 'chi heavy, and it involves KOREAN TACOS, which are loaded with marinaded pork belly, mustard seed 'slaw, pickled garlic, and crackling. 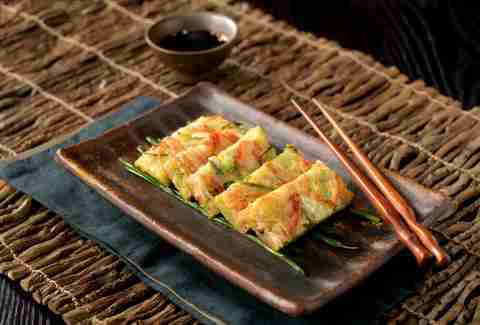 Korean pancakes. Though, they're really not that pancake-like. They're mixed with flour batter, and coated with egg, then fried, and they're generally loaded with meat, seafood, or veggies. Often a side dish. Hit up Holborn's huge Kimchee for a decent selection.